note: works in progress are at the end of the whole list (the bottom of the page). requested review volume for J. Phys. A: Math & Theor. (2019). submitted to New J. Phys. (special issue: Multilayer Networks) (2019). submitted to Nature Comm. (2018). Improving "REM-sleep performances" in neural networks with "simulated annealing"
submitted to Applied Soft Computing (2018). submitted to J. Stat. Phys. arxiv (2018). J. Phys. A Parisi-70 arxiv in press (2018). Journal of Mathematical Physics 60, 03336, webpage arxiv (2019). Dreaming Neural Networks: forgetting spuirous memories and reinforcing pure ones. Neural Networks 112, 24-40, arxiv website (2019). Drug discovery today 24(2), 517, website ﻿paper﻿ (2019). EuroPhys. Lett. 121, 38001,arxiv paper (2018). Complexity 7423297, arxiv webpage (2018). Phys. Rev. E. 97, 022310, arxiv webpage (2018). Phys. Rev. E 96, 042156, arXiv webpage (2017). 77. A. Barra, & al. 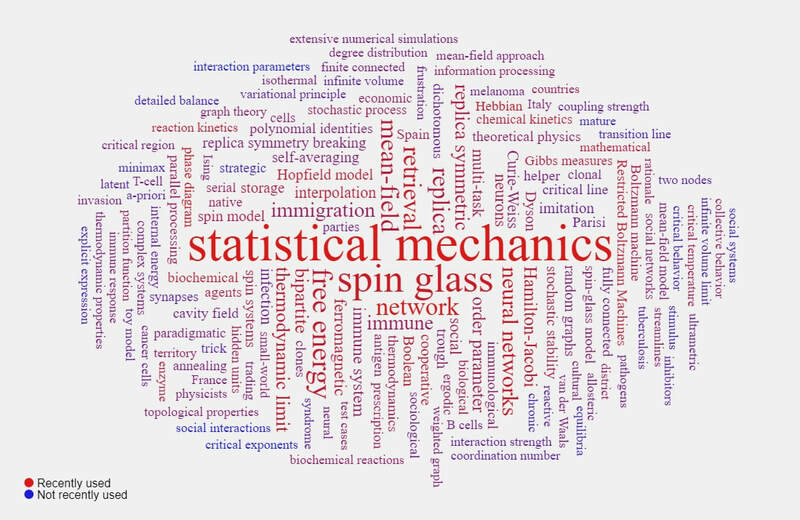 Journal of Statistical Physics 168, 1085, paper arxiv webpage (2017). Europhysics Letters 117, 28003, paper arXiv webpage (2017). Nature Scientific Reports 6, 36314 webpage arxiv (2016). Mathematical Physics: from Theory to Applications (book), World Scientific Press paper preprint book (2015). Annals of Physics 359, 290-299 arxiv paper (2015). Nature Scientific Reports 5, 9415 paper arXiv webpage. (2015). Physical Review E 91, 062807, arxiv webpage (2015). Neural Networks 66, 22-35 arxiv paper webpage (2015). Physical Review Letters 114, 028103, paper arXiv paper webpage (2015). Journal of Physics A: Mathematical & Theoretical 48, 015001 arXiv webpage (2015). Physical Review Letters 113, 238106 arXiv paper webpage. (2014). Proceedings of the Royal Society A (London), 470, 20140589 webpage paper (2014). Nature Scientific Reports 4, 6639, paper, arXiv. (2014). New Journal of Physics 16, 103034, paper, arXiv. (2014). NCTA2014: Neural computation theory & application (Proc.s), paper arXiv scipress. (2014). The article has been selected in the highlights (best papers of the year) of the IOP 2012 (see here). Journal of Statistical Physics 147, 2, 351, paper webpage (2012). Selected also by the Advances in Engineering highlights. Selected by the American Physical Society for publication even in the annals "Virtual Journal of Biological Physics Research"
102. A. Barra, et al., Stochastic dynamics of echo state networks. 101. A. Barra, et al., the Hopfield model at medium storage: against the "low and/or high load" perspective. 100. A Barra et al., Learning in Immunology: hierarchical cytokines, high-dose tolerance and anergy trought threshold' shifts. 99. E. Agliari, A. Barra, I. Iacobacci, R. Navigli, Pretraining neural nets for word embedding: a rigorous approach.